Anzac Day was fittingly commemorated at the Muckleford South State school on Thursday afternoon last. As a mark of respect to the memory of our brave soldiers, practically every person in the district was present at the gathering. The programme, as suggested by the Education Department, was creditably carried out by the school children, under the direction of the head teacher (Mr Crellin). Added interest was given to the proceedings by the presence of two "dinkum" Anzacs—ex-Ptes. Griff. Jenkins and Frank Heritage—who were given a rousing reception, and who afterwards gave very interesting addresses. Speeches appropriate to the occasion were given by Messrs. H. W. James, T. Moon, and E. Crellin, and the recitation, For the Fallen, was feelingly recited by Master Percy Rilen. 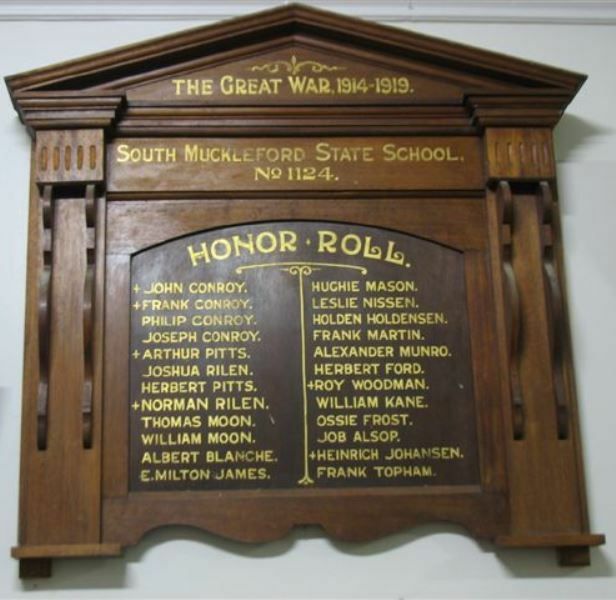 At the close of the ceremony, it was unanimously decided by the residents to procure for the school a suitable honor roll to contain the names of the thirty ex-scholars who are or have been on active service. It is expected that the unveiling ceremony will take place very shortly. Castlemaine Mail (Vic), 29 April 1918. THE GREAT WAR 1914 - 1919.